Looking for antiques in Central Kentucky near Beaumont Inn? I have always wanted to go and this winter I did make it to the Greentree Antiques and Tearoom in Lexington, Kentucky. What a treat! Each month the tea menu changes and believe me it is more than just tea—soup, scones, entrée, tea sandwiches, 4 desserts, and oh yeah, tea. Reservations are required, 859/455-9660. Before or after your tea be sure to look around at the lovely antiques, beautiful china and crystal, interesting serving pieces and pick up the brochure for the Lexington Antiques Dealers Association. You can take the day looking around at the lovelies. Gay Redding, the one of the owners, is also very involved with the Bluegrass Trust, one Lexington’s oldest preservation groups. He often has listings of BGT activities. Last fall we ventured to The Rockcastle River Trading Company in Livingston, Kentucky. Jon Carloftis, landscape designer and lecturer of international fame, has perfected the gardens of his childhood home. The family home and property are on the river with abundant native plants—when was the last time you saw a wild Kentucky Magnolia? The gardens wind all around the property giving the guest a peaceful, content feeling. His mother, Lucille, is the shop keeper, but more importantly she is a very gracious hostess who tells fascinating stories of her family history of the area. The shop has all types of garden furniture, antiques, cookware, soap, and of course Jon Carloftis designed Louisville Stoneware. It is open April 1-December 31, Monday-Saturday, 9-5. Take I-75 South, exit 49, right off exit, left at stop sign, 1 mile on right is Rockcastle River Trading Co.
You can spend the day or two shopping in the area—antiques, clothes or just “nosing around.” Downtown Harrodsburg and Danville have many shops to find something unique or collectible. Wakefield-Scearce Galleries, 525 Washington St, Shelbyville, K. Housed in a 1790 structure, once a girls’ school, this world-renown antique and gift gallery delights visitors with a large selection of English antiques and more. Delicious lunches are served at Science Hill, next to the Gallery. 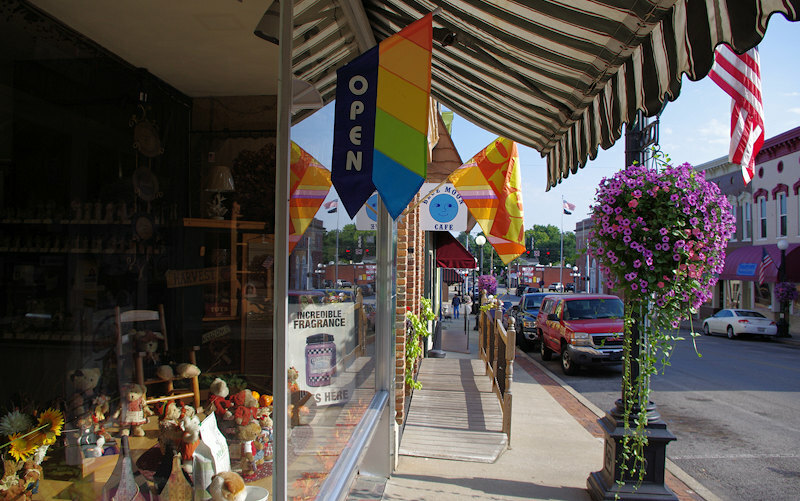 Shelbyville is a great antique shopping place with many antique malls—you might find that antique you have searched the world over! Irish Acres Gallery of Antiques, 4505 Fords Mill Rd, Nonesuch, Ky. (close to Versailles, KY.) Once the Nonesuch Elementary School, Irish Acres has filled each of the 3 floors with almost everything you can think of–furniture, silver, crystal, postcards, dolls, jewelry, rugs, you name it they may have it. The basement is home to The Glitz, a fun place for lunch. Nettie Jarvis Antiques, 111 Taylorsville Rd., Bloomfield, Ky. Linda Bruckheimer, wife of famous producer, Jerry Bruckheimer, owns this wonderful shop. Linda is from Kentucky and took great interest in Bloomfield, restoring several buildings and investing in the Main St. The shop is two-stories of fine Kentucky and American antiques. The US 127 Corridor Yard Sale begins at Covington, Kentucky, and runs South through Harrodsburg to Chattanooga, TN, then switches to the Lookout Mountain Parkway, continuing to Gadsden, AL. The annual sale is early August. Also, come to the 400-Mile Sale across Kentucky in early June. We found another great antique shopping experience at Athens (pronounced with a long A) Schoolhouse Antique Show on the north side of Lexington. Held the second weekend April through October, 200 dealers put on this monthly show with Colonial to Depression-era antiques, fine art, pottery, quilts, textiles rugs, an antique dining table and the list goes on and on. No, I didn’t buy anything but I keep thinking about what I wished I had bought—maybe next month! It is a beautiful setting also with lunch options which we need to try next time. Check out the dates at www.antiqueskentucky.com and plan your next visit to go exploring.